Hello everyone, just registered and wanted to say hello and ask for some advice. My wife and I were on the road full time from early 2014 when I retired until this past August. We sold our home and put enough furniture in storage to furnish a small place if we wanted later. We recently decided to take a break and moved into an apartment in early August. After 3 months we both are missing the freedom of full timing in the RV. We currently have a 2013 Cedar Creek 36ckts. It's served us well for the most part other than having to replace one of the air conditioners 6 months after hitting the road. We were in a hot spot and due to some family flying in to stay with us we couldn't wait for the warranty to take care of it and had to replace it out of pocket. After that I began to wonder if we would wear the RV out in only a few short years with continued full time living. I have to say that anytime I passed a Redwood on the road or one pulled into the park we were staying, I'd always take note of how nice they looked. They all look brand new. 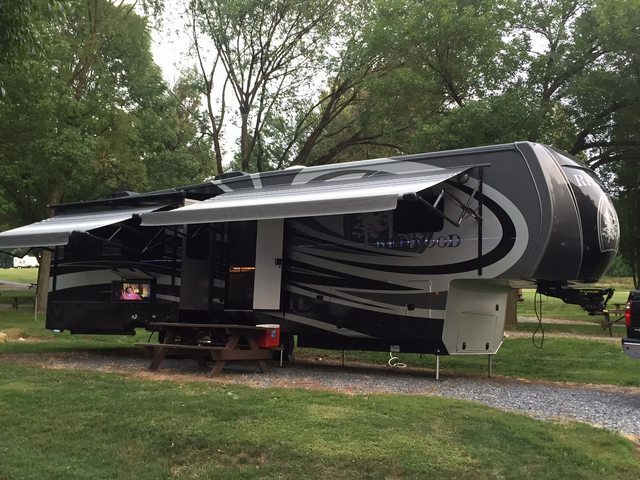 Fast forward to now, I'd done some research on "higher" end RV's that might be more appropriate for FT use but never really thought we could upgrade anytime soon. Yesterday we decided to go check out a small RV show that was going on locally. The first unit we came to was a 38RL. It was similar in layout to our Cedar Creek but the extras and the build made us take note. We moved on and looked at some other units including a Montana that had we had some interest in. The layout was nice but the quality just wasn't there. After looking at the Redwood everything else was a waste of time. We decided to take another look at the 38RL on the way out and ended ups spending a long time with the Redwood Rep in town for the sale. He indicated that he could offer some extra help to try and make a deal work for us. We had no intention of buying when we arrived but decided to let them see what they could do. Just got a call from the dealer and the terms on the new 16 model, while pretty good were just beyond what I wanted to do. The dealer said he had been in touch with the Rep and he had found a new 2015 model identically equipped as the one we looked at. With the clearance pricing and factory incentives the payment is within 20 dollars per month of my Cedar Creek. Obviously I'm adding a few years to the financing but I feel like I'm upgrading my unit significantly. Pretty sure we will do the deal but I'm wondering what the 2015 will be missing that the 2016 might have ? Also looking for anything that I should specifically look/ask for before taking delivery ? If your comparing an early 2016 to a 2015, they are real close...if its a later version (fall release) the differences are a bit numourus .. The biggest is the straight roof line (standard)the energy manegement system, the 3rd ac,, (options). We almost purchased a 2016 Cedar Creek ,until we saw the RW.. Like you, we could not do it, until the Redwood Sales Rep got involved with the dealer.. Between the incentives , push/pull , the dealer and RW, we got lucky!!!! the main thing that would turn me to a 2016 over a 2015 would be the possible 3rd a/c unit and the energy management system. Also, you have to consider the "lot rot" that happens on ALL rvs that sit on a lot for any length of time. Some of this "rot can be as simple as fine scratches in the paint from the dealers using brushes while washing or doors that have been slammed in RV shows. I would advise you to see what the build date is on the 2015 unit. The Residential Refer is a must. The first thing the wife said when I mentioned the 2015 was...dishwasher ? The 16 did have a heat pump on the main air and that would be something new for us, how does it work out ? I'm pretty sure we'd like to have that too. The 2015 will have the heat pump. Power cord reel on our 15 was a must so the dealer installed it in the deal, no big deal. The straight roof line leaves a lot to be desired in my opinion, makes it look to square.....just sayin. Thanks, I thought I remembered someone telling me the heat pump was only good until a certain point. Still worth having it seems. This is the first trailer I had with both the heat pump and fireplace... Both are a great addition... And I am NOT a fan of the straigh roof line either... As far as the dishwasher , my wife LOVES it... It all depends on the options that were ordered on that "15"